You may have noticed that I haven’t blogged for a week, this has caused me a little anxiety, but not quite enough to motivate me to blog. The reason for a lack of blog activity is that I am now back in Devon and enjoying time with family and friends and it’s left little room for sitting at a laptop tapping away about stuff that happened to me a couple of weeks ago. But I know that if I don’t get on with it I will have a month’s worth of blogging to catch up on and that sounds like hard work. So I’ve finally forced myself to hole up in the motorhome and get on with it. 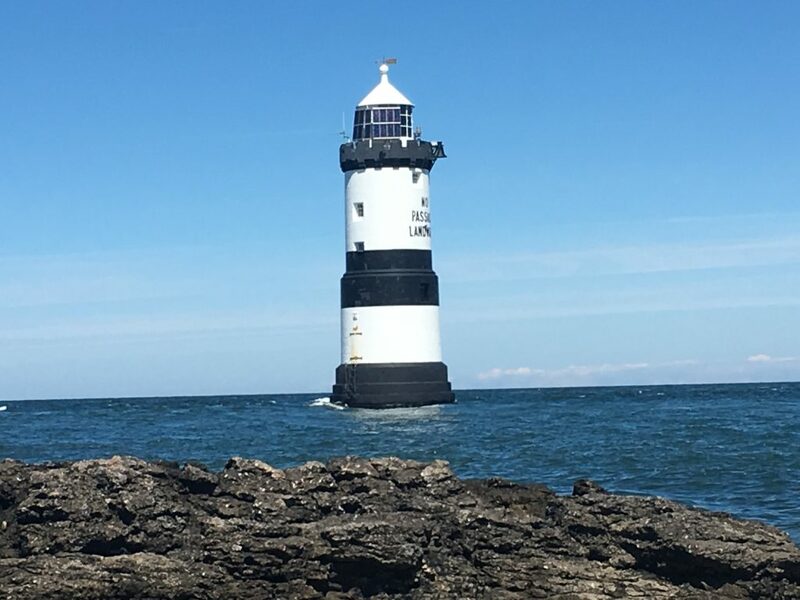 It has been more than two weeks since we left Anglesey. Our final few days were spent in coastal locations to the North and South of the Island. We stopped in Amlwch at a car park near the harbour, where there is easy access to the coastpath leading eastwards. It was here that we had our first real NIMBY experience. I’ve always known that there would be people who don’t like motorhomes parking up, you only have to read the views of my home town Exmouth’s community facebook forum to know how vitriolic people get about ‘freeloaders’. And in Amlwch there are ‘No Overnight Camping’ signs on the carpark which did indicate that there may be a few disapproving people about. So it wasn’t a great surprise to be met with an individual who took exception to us having been there overnight. We had an interesting debate about the difference between overnight parking and overnight camping before he threatened us with a very personalised fine ‘because I’m on the council’. Anyway that was after we’d spent a very pleasant day and quiet evening (we were the only vehicle in the carpark until the dog walkers showed up in the morning) in the local area. So we were able to get in the motorhome and chug off to our next destination. 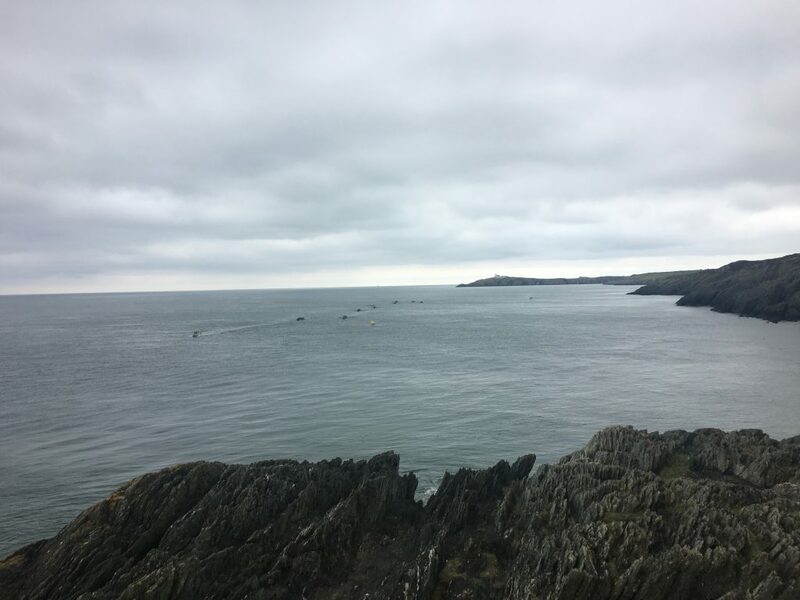 The coastline to the east of Amlwch is invitingly rocky – if you are a fisherman – the rocks step down to the sea, and the water is relatively deep directly off shore. So we had a walk along the coastpath and stopped a couple of times for Paul to do a spot of fishing. Along the way we watched some local gig racing between Porth Eilian and Amlwch. Not knowing who we were supporting we gave them all some encouragement. It looked like hard work. We walked out to the lighthouse on the headland just beyond Port Eilian where we spent an hour in the sun watching the dolphins (or possibly porpoises) frolicking in the sea, some of them came pretty close to shore and then seemed to follow us as we retraced our steps back to the motorhome. They were probably the reason that Paul had little luck fishing that afternoon, but later that evening we went back out for a spot of fishing on the high tide which was more successful. After Amlwch we popped to the National Trust ‘stately home’ at Plas Newydd. 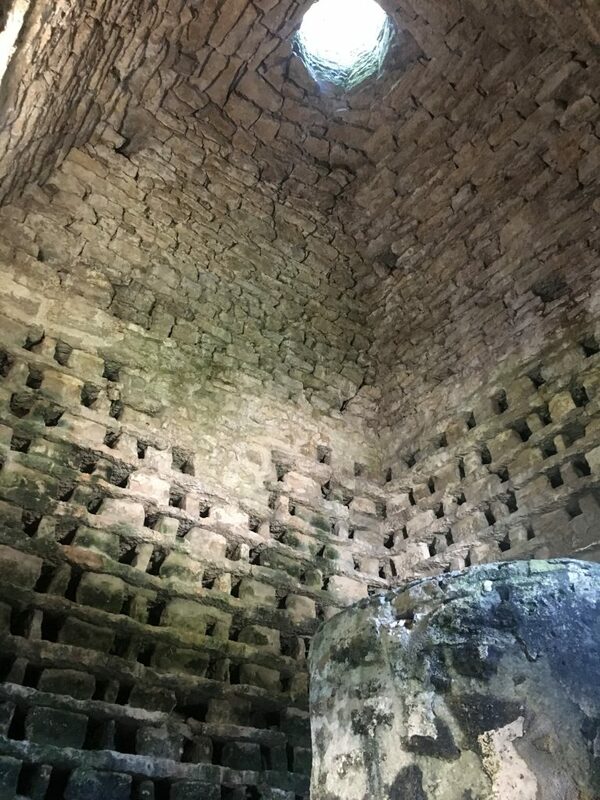 The house and estates had some interesting features. Particularly Rex Whistlers trompe-l’oeil mural in the dining room which was fascinating, with it’s clever use of perspective to make the scene change according to the viewers position, and the collection of military memorabilia, including the wooden leg of the first Marquess of Anglesey who lost his leg at the battle of Waterloo. 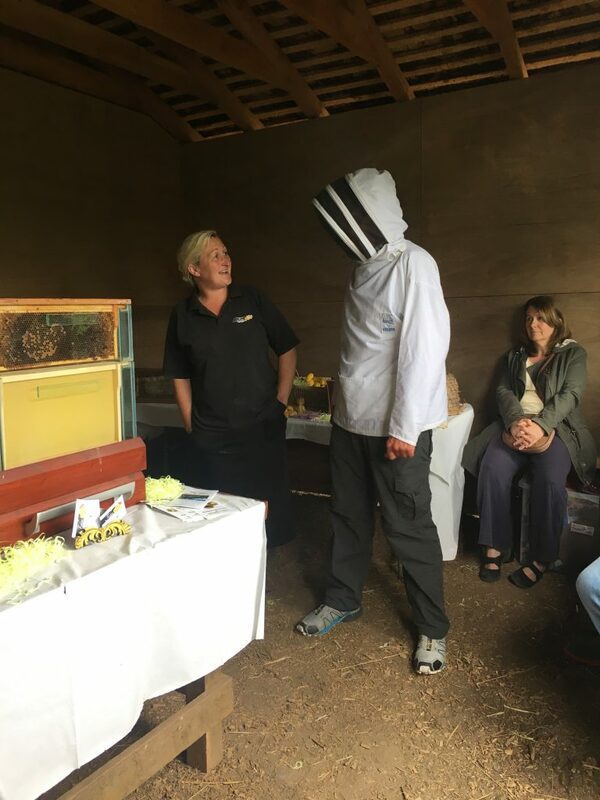 Paul also provided some entertainment doing a bee’s ‘Waggle Dance’; we had stopped to listen to a talk about bees which was probably more aimed at children, but with only two teenagers available and a lot of interaction to get through the bee lady decided that Paul would take least persuading to wiggle his bottom in public. I laughed so hard I forgot to video it. Following this we had a quick overnight stopover on the south coast at a small parking space next to the Sea Zoo. Really it was too small for us but we were tired and not inclined to move again, so wedged ourselves in as tightly as possible and hoped that no one else wanted to join us. Another motorhome did turn up but they opted for a spot a couple of hundred yards up the road. Phew. Beaumaris was our final stop on Anglesey. Here there is a large car park on the sea front which tolerates overnight parking (although yet again there are ‘no motorhomes, caravans etc’ signs at the entrance of the car park. Beaumaris was busy – a sign of the impending school holidays. There were coach parties galore visiting this pretty and tourist friendly village with it’s impressive castle (we only saw it from the outside) and narrow streets. The seafront itself is long but not a beach for sitting and sunning yourself on. From Beaumaris we cycled to Penmon point. The land here is privately owned and cars or motorhomes pay a toll to drive to the car park. Motorhomes are allowed to stay overnight but we decided to cycle here instead. 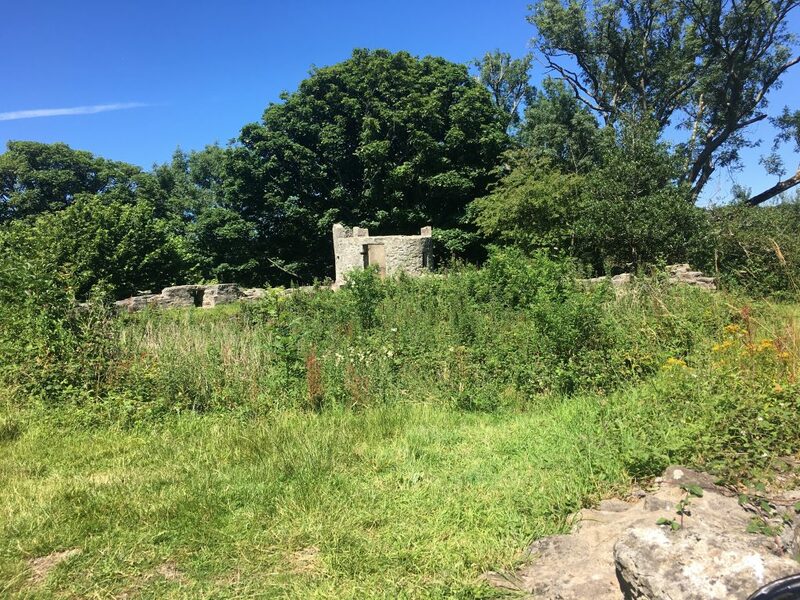 On the way we took in a small ruined castle – Castell Aberlleiniog, he ruined priory at Penmon point; the immense dovecote near the priory and the lighthouse with it’s fog bell marking the channel between the point and Puffin Island. 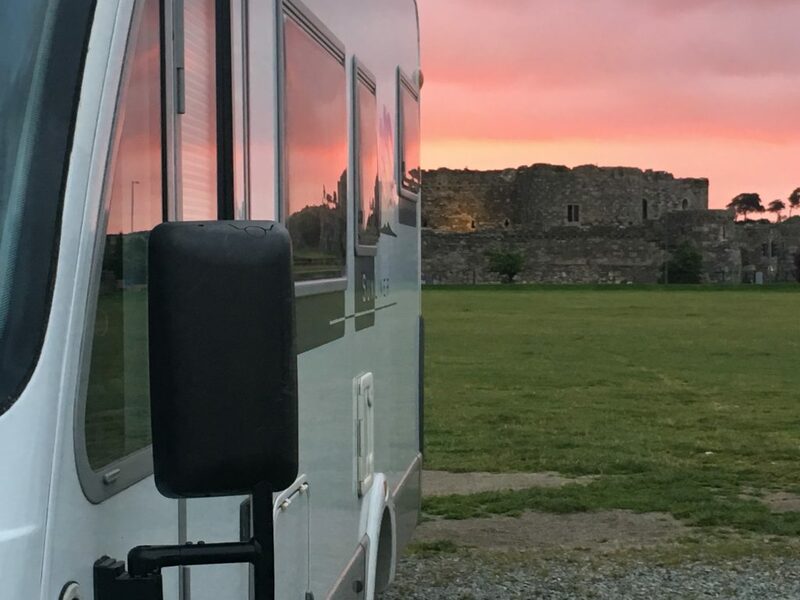 That evening we saw the most amazing cherry red sunset as the sun dropped behind the castle – hopefully the shepherds delight of fine weather the next day. 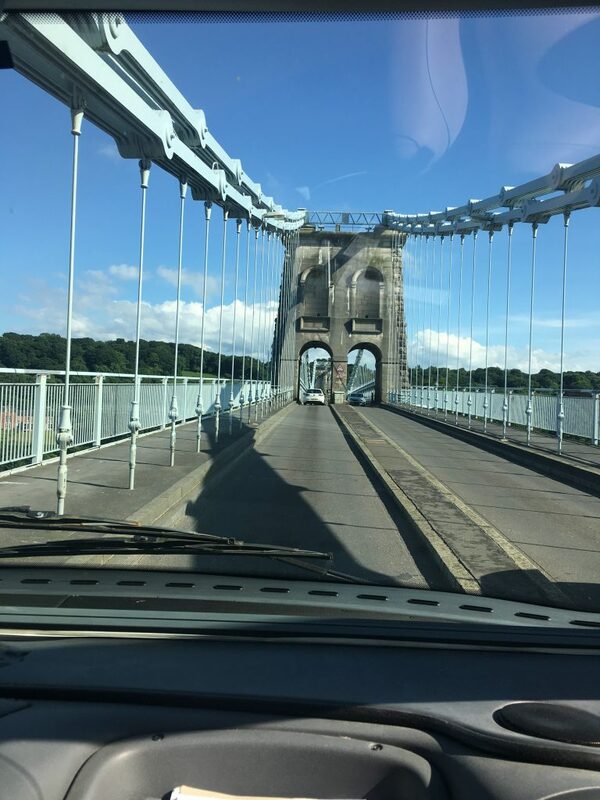 That was it for Anglesey – the following morning we drove through the – just wide enough – arches of Thomas Telford’s Menai bridge and headed back across to the mainland.